Even the Gods like ice cream! 9 Responses to Even the Gods like ice cream! No doubt, there was some inside joke or real-life reference intended here by the Marvel staff . . .
Looks like sarcasm to me. He shouldn’t be sarcastic, though. Creamsicles are GREAT. 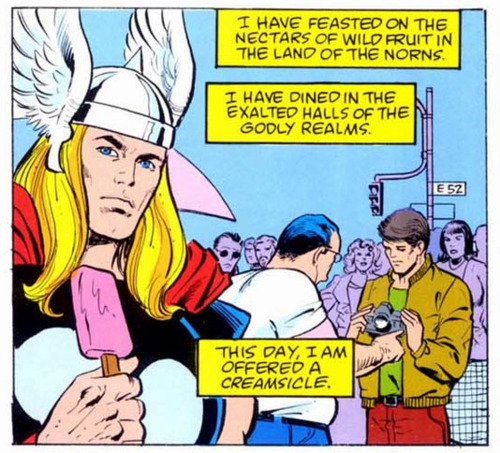 A god who scarfs as many Pop-Tarts as he does has no business scoffing at a Creamsicle. Geez, can a god get some respect around here? At least give the man a cone, geeze! Is it too much to ask The Son of Odin not to get his hands so sticky! This dastardly plan musy be a Loki trick. I mean Loki is a child of a Frost Giant right?